A successful joint collaboration between researchers at the Hebrew University of Jerusalem and the startup company TyrNovo may lead to a potential treatment of brain diseases. The researchers found that TyrNovo’s novel and unique compound, named NT219, selectively inhibits the process of aging in order to protect the brain from neurodegenerative diseases, without affecting lifespan. This is a first and important step towards the development of future drugs for the treatment of various neurodegenerative maladies. Human neurodegenerative diseases such as Alzheimer’s, Parkinson’s, and Huntington’s diseases share two key features: they stem from toxic protein aggregation and emerge late in life. The common temporal emergence pattern exhibited by these maladies proposes that the aging process negatively regulates protective mechanisms that prevent their manifestation early in life, exposing the elderly to disease. This idea has been the major focus of the work in the laboratory of Dr. Ehud Cohen of the Department of Biochemistry and Molecular Biology, at Hebrew University of Jerusalem’s Faculty of Medicine. 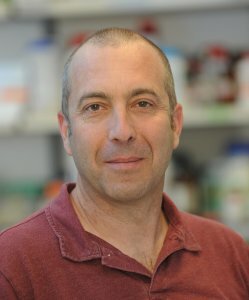 Dr. Cohen’s first breakthrough in this area occurred when he discovered, working with Dr. Ehud Cohen, that with models, reducing the activity of the signaling mechanism conveyed through insulin and the growth hormone IGF1, a major aging regulating pathway, constituted a defense against the aggregation of the Aβ protein which is mechanistically-linked with Alzheimer’s disease. Later, he found that the inhibition of this signaling route also protected Alzheimer’s-model mice from behavioral impairments and pathological phenomena typical to the disease. In these studies, the path was reduced through genetic manipulation, a method not applicable in humans. Dr. Hadas Reuveni, the CEO of TyrNovo, a startup company formed for the clinical development of NT219, and Professor Alexander Levitzki from the Department of Biological Chemistry at the Hebrew University, with their research teams, discovered a new set of compounds that inhibit the activity of the IGF1 signaling cascade in a unique and efficient mechanism, primarily for cancer treatment, and defined NT219 as the leading compound for further development. Now, in a fruitful collaboration Dr. Cohen and Dr. Reuveni, together with Dr. Cohen’s associates Tayir El-Ami and Lorna Moll, have demonstrated that NT219 efficiently inhibits IGF1 signaling, in both worms and human cells. The inhibition of this signaling pathway by NT219 protected biological models from toxic protein aggregation that in humans is associated with the development of Alzheimer’s or Huntington’s disease. The discoveries achieved during this project, which was funded by the Rosetrees Trust of Britain, were published in the journal Aging Cell (“A novel inhibitor of the insulin/IGF signaling pathway protects from age-onset, neurodegeneration-linked proteotoxicity”). The findings strengthen the notion that the inhibition of the IGF1 signaling pathway has a therapeutic potential as a treatment for neurodegenerative disorders. They also point at NT219 as the first compound that provides protection from neurodegeneration-associated toxic protein aggregation through a selective manipulation of aging. Cohen, Reuveni, and Levitzki filed a patent application that protects the use of NT219 as a treatment for neurodegenerative maladies through Yissum, the technology transfer company of the Hebrew University. Dr. Gil Pogozelich, chairman of Goldman Hirsh Partners Ltd., which holds the controlling interest in TyrNovo, says that he sees great importance in the cooperation on this project with the Hebrew University and that TyrNovo represents a good example of how scientific and research initiatives can further health care together with economic benefits. Dr. Cohen’s laboratory obtained an ethical approval to test the therapeutic efficiency of NT219 as a treatment in Alzheimer’s biological models, hoping to develop a future treatment for hitherto incurable neurodegenerative disorders.